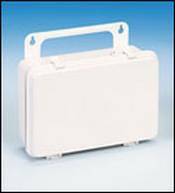 16 Unit First Aid Kit box. One-piece construction with living hinge molded-in partition and gasket. Features positive catches and combination handle/hanger. 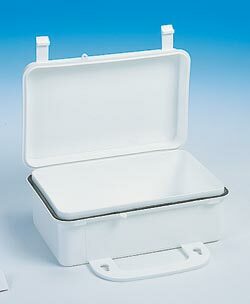 This box is used for making bulk first aid kits or using unitized boxes of first aid supplies. Also used by many for great marketing campaign ideas "The first aid kit for _____" etc. 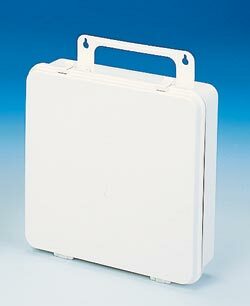 We can add standard first aid logos to the box or your custom label. 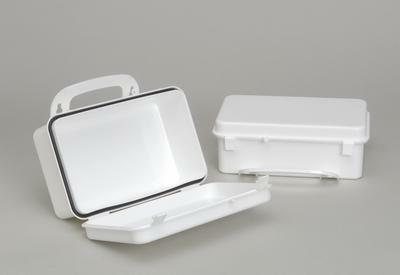 Made of White Polypropylene, weather resistant and will not rust or corrode.16 unit Polypropylene box without gasket. Great for "25-person" kits or where size is a consideration.